Last year I bought some day old chicks from the market and popped them under a couple of broody bantams I had who had been sitting on china eggs for 21 days (the allotted time for real hens' eggs to hatch). One of the chicks I bought turned out to be a cockerel - a rather handsome cockerel and we have decided that so long as he behaves and doesn't turn nasty, as some can, he can stay. So now he needs a name and for that I need your help. What should we call our cockerel? 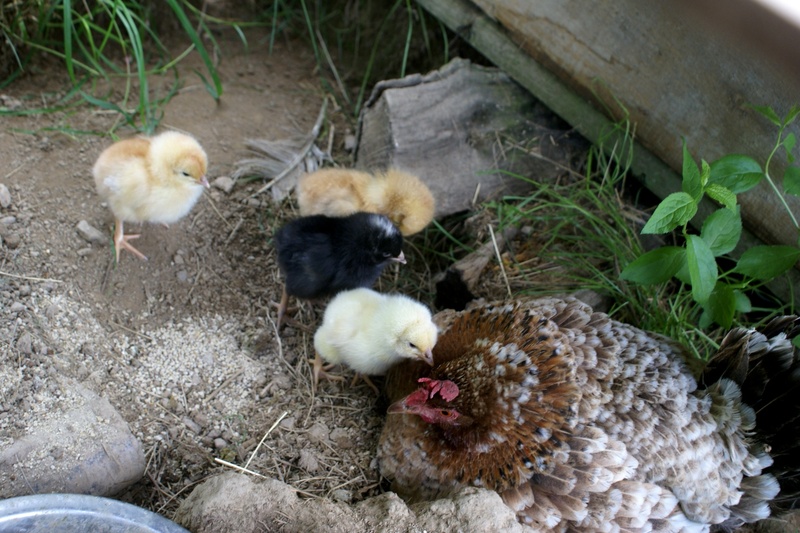 ...and here he is at a few days old with his adoptive Bantam Mum - he's the black one in the middle as yet not showing his magnificent adult plumage. 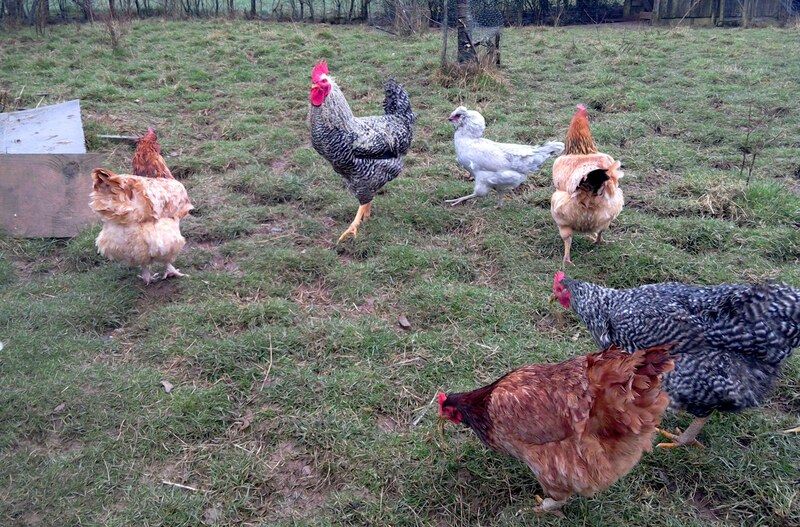 He has a loyal following of 19 female chickens of all sorts and colours. We have 2 Lavender Araucanas who lay the most adorable blue eggs, one Red Orpington and a selection of white, brown and black non pedigree farm birds. Oh, and Baptista, a delightful hen with feathered feet and a funny head decoration who came from a friend - find out here how Baptista got her name! So, like I say, it's over to you to name our handsome boy. Remember though we are family friendly so keep your suggestion clean. 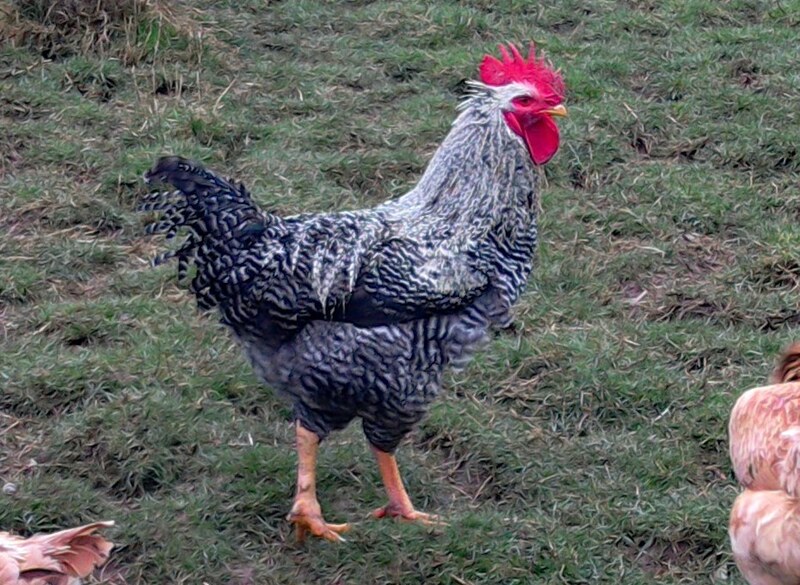 Also anything that vaguely resembles Boaty McBoatFace won't get chosen (sorry as that would be lost on any foreign guests we have here) and Colin is not an option as he was our last cockerel. Pop a comment below and we'll choose the one we most like. If you have difficulties adding a comment you can also add one on Facebook or Instagram. Please give your ideas up to We'll choose his name from those given on Feb 15th and we'll announce our choice on Feb 16th.